Today I'm Going to Wear . . .
On sale October 21, 2014! 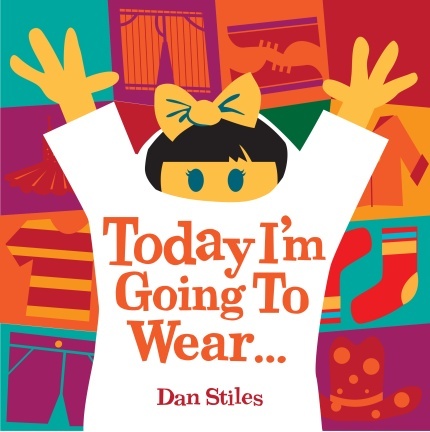 Dan Stiles wrote the perfect book for anyone who has ever asked a small child, "What are you going to wear today?" Today I'm Going to Wear . . . chronicles the challenges of getting dressed with endless options. Should this little one wear her cowboy hat with polka dots, a spooky tee shirt, bunny muffs? Perhaps all at once? An equally amusing follow up to Dan Stiles' first book, Put On Your Shoes!, this one will resonate with parents who inevitably discover their kids have their own fierce, funny personalities. The rhyming text, bold illustrations, and retro style are sure to help parents identify with their spunky kids. Dan Stiles is the author of Put on Your Shoes! (POW! 2014) and Baby's First Book Blocks (POW! 2014). A Portland-based artist whose boldly graphic style has made his work instantly recognizable, Dan is known best for his work with musicians for whom he has created hundreds of posters and CD covers. His work has garnered numerous awards, is regularly featured in national gallery exhibitions, and has been reproduced in a wide variety of books and magazines. High-res scans to your specification are available upon request; scanning from the book or lifting images from the mechanical file are strictly prohibited. Mandatory credit line: From Today I'm Going to Wear . . . by Dan Stiles, published by POW!/powerHouse Books.